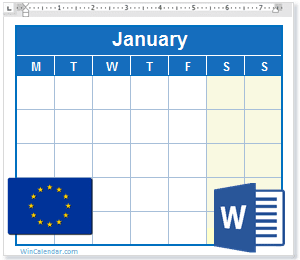 2019 blank and printable Calendar with European Union Holidays in Word document format. The calendar downloads are also compatible with Google Docs and Open Office. Ideal for use as a work calendar, church calendar, planner, scheduling reference, etc. All EU holiday calendar templates are otherwise blank, macro-free, fully editable and set for printing! All Calendar Word files are in safer docx format. EU calendars are also available in Excel spreadsheet and PDF format. Calendar in Weekly & Monthly layouts. Monthly Calendars with Holidays (EU) in MS Word format. For following year calendar with holidays see:2020 Calendar with EU Holidays, 2021 Calendar with EU Holidays. For prior year calendars see: 2018 Calendar with EU Holidays. Display Religious (Catholic, Christian, Jewish & Muslim supported). Import Microsoft Outlook Calendar & Google Calendar data. Store daily apts in WinCalendar (pop up Calendar for Excel, Word & Windows). Import data from Outlook, Google, Yahoo or ICAL on generated calendars!